Reality TV shows often like to throw around the phrase "social experiment" to add some gravitas to a new series bringing a group of strangers together that simply just works off the precedent set by early reality shows like The Real World and Survivor. The latest "social experiment" coming to our TV screens is FOX's new reality show Utopia , premiering Sunday, September 7. The funny thing is, Utopia reminds me a lot of Big Brother , the "people trapped in a bubble society" reality show of record. Utopia brings together 15 strangers of various ages, ethnicities, and backgrounds to live in a remote location for a year where there's supposedly absolutely nothing waiting for them. The idea is that they build everything up from scratch, from the infrastructure to the rules of the land, and they are free to challenge existing laws, morals, and standards that prevail in our society. Oh, and we can watch everything unfold through 24/7 Utopia live streams available on the official website. Though the series has yet to air, the Utopians have already been settling in for more than a week, so you can hop over and check out the live streams now. When I hear "24/7 live streams," I immediately think of Big Brother, which has become famous for the use of this storytelling tool since its first season. The voyeurism of Utopia, in addition to having 15 strangers of diverse backgrounds live together gives the show a strong Big Brother vibe. John de Mol, the creator of Big Brother, is also the mind behind Utopia. So do we have another Glass House situation on our hands? (In 2013, ABC created a reality show that was basically Big Brother. It eventually shattered, so to speak.) Not quite. Utopia is actually pretty different. It reminds me more of short-lived reality shows like 2007's Kid Nation and 2012's The Week the Women Went. These were also meant to be "social experiments" that aimed to see what would happen when children created their own society without adults around and women left the community of Yemassee, South Carolina, respectively. First of all, Utopia just looks hard. There's no lounging by the pool or chilling in the HoH room on this show. With limited supplies, basically no infrastructure, and no bathrooms, this is not the three-month summer vacation that Big Brother is. Utopia is actually more like Survivor in that the contestants have to be much more resourceful, rugged, and self-reliant to live. According to the show's official website, the Utopians just got electricity, and they've been out there for more than a week. They even have to figure out ways to make money to buy their supplies — once they find out how to get them — or they will supposedly starve. The biggest hardship the Big Brother houseguests face is eating slop and living in a not-so-comfy room as a Have Not. That seems like a pleasure cruise compared to what the Utopians will have to go through. The core of Utopia is also that there is no existing power structure and seemingly no rules, which is pretty much the exact opposite of Big Brother. 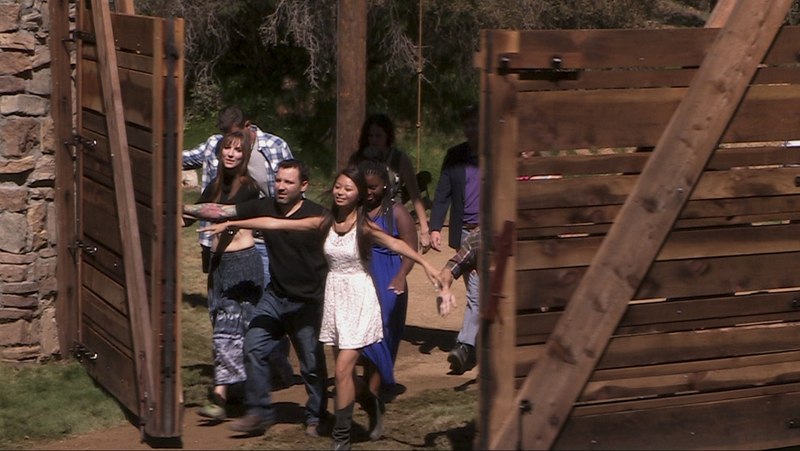 In Utopia, contestants will decide if they want a leader or any government at all. Will it be a democracy or a dictatorship? They can also make their own laws or let anarchy run amok. This is supposed to be a new society where pre-existing norms need not apply. On the other hand, Big Brother is all about rules and power dynamics. You don't get to Season 16 without them. The HoH is immediately put into a position of power by nominating two people for eviction each week, and so the nominees are obviously in a subordinate position. Competitions like this season's Battle of the Block and the usual Power of Veto have the ability to shift the power in the house slightly every week. The prospect of being put on the block and possibly evicted dictates everything the houseguests do. One of the more interesting aspects of Utopia is that new Utopians can enter the game throughout the season, which no reality show has really done before. According to Utopia's official website, casting never stops for the show, so if all of this sounds like a neat experience, there you go. The audience watching at home gets to nominate potential newcomers and also be involved in deciding who has to leave Utopia. Big Brother has only ever brought former houseguests back into the game, not entirely new people, and usually only does this one or two times a season. During the inaugural season of the show, the audience actually chose who would be evicted every week, but as we all know, this has changed to make the voting completely internal with the audience participation in the show limited to votes for Have Not food items and Team America missions this season. Possibly the most glaring difference between the two reality shows is that there's no promise of a prize in Utopia. Right now, it looks like the goal of the contestants is just to build a better society, and that's it. We all know that the whole point of Big Brother is to win the $500,000 prize at the end, which causes people to do some pretty crazy things to get it. Will Utopia be as interesting if the contestants don't have the motivation to lie, scheme, and manipulate their fellow players? We'll have to wait and see if this "social experiment" is entertaining, too.